Explanation: What lies beneath the layered south pole of Mars? A recent measurement with ground-penetrating radar from ESA's Mars Express satellite has detected a bright reflection layer consistent with an underground lake of salty water. The reflection comes from about 1.5-km down but covers an area 200-km across. Liquid water evaporates quickly from the surface of Mars, but a briny confined lake, such as implied by the radar reflection, could last much longer and be a candidate to host life such as microbes. Pictured, an infrared, green, and blue image of the south pole of Mars taken by Mars Express in 2012 shows a complex mixture of layers of dirt, frozen carbon dioxide, and frozen water. white rhinocerus went extinct on earth in 2015. 111 years after the creature was given a scientific name it went extinct. it does not make sense questioning existence of life on mars when creatures of the earth are in peril. even if there is microbial life on mars it does not have any significance in terms of human existence. the manner of human consumption of the earth's natural resources is an activity which is taking its toll on the well being of the earth. nasa should recall juno space craft (on mission to jupiter) to earth for terestrial survey: polar ice melt; global warming; extinction of species; oceanic pollution; deforestation; armaggedon . . .
the next leap in human cosmic involvement will invove asteroid mining - excavation of a selected asteroid for mineral. extra terestrial alien of human kind will be needed for this effort. an outcome of such venture will be excavation of a chamber inside a large asteroid (such as 511 davidea) which may be modified for human habitation. Interesting image. Might there be a 3D version to ponder? One wonders how thick the sharply defined layers are. However, the use of the word 'dirt' is not very helpful to an enquiring mind. Would you throw it away [with disgust] into the nearest bin if samples removed from this region were to be somehow brought back? With the current dust storm(s) raging across Mars, might there be perhaps be another more scientific term for 'dirt' for the narrative in the astronomy storybook? But without any indication of length totally incomprehensible. What are we seeing? 1 m? 1 km? 100 km? Giving an idea of length/distance in a photo would be a good custom. According to the 'image' link, the Southern Mars Cap is around 350 km in diameter. The image here is of the residual South Polar Cap, showing most of it, with a shape familiar to students of Mars. Its irregular ovoid shape has dimensions of about 5 degrees by 7 degrees of Martian latitude, and it is offset from the actual South Pole so that the Pole is located on one of its edges. This is not the area in which the subsurface brine was found. Indeed, a broad area of the South Polar Region was searched with the ground penetrating radar aboard Mars Expresss, and the densest area of reflection (from a depth of about 1500 meters, indicating the top of the brine layer) is centered at latitude 81 degrees south and longitude 193 degrees east. Furthermore, it is only 20 km across. Softer reflections were detected from other South Polar Region areas, but the assertion of a subsurface lake was made primarily for this densest reflection. In view of this, the APOD today is slightly misleading. The lake is not below the South Polar Cap seen here. of science or of modern technological advances (e.g., Viagra). Explanation: ... a complex mixture of layers of dirt, frozen carbon dioxide, and [url=https://apod.nasa.gov/apod/ap050720.html]frozen water. Dust is the more commonly used term, (equivalently disgusting in many settings), but when dust is on the surface of a world it is ... dirt. Or, in this case, with the CO2 and water mixed in perhaps the more precise wording would be "mud". P.S. The "more scientific term for 'dirt' for the narrative in the astronomy storybook" is "metals". Good old 'dirt' is way more understandable. Last edited by BDanielMayfield on Tue Jul 31, 2018 3:02 pm, edited 3 times in total. I agree with all your observations about our foolish management of Earth. But it would be foolish, as well, to abandon our scientific exploration of the Universe. It could have profound scientific and social impact to find life, or evidence of past life, on another planet. And our exploration of other planets doesn't impact our exploration of our own. NASA already operates a huge number of Earth observation instruments. And much of that technology has followed from the development of deep space probes. For some reason... I got a hankerin’ for Tiramasu... or is it Terramasu? Explanation: What lies beneath the layered south pole of Mars? 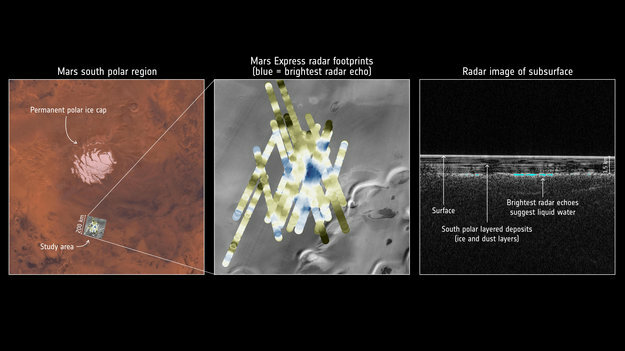 A recent measurement with ground-penetrating radar from ESA's Mars Express satellite has detected a bright reflection layer consistent with an underground lake of salty water. The reflection comes from about 1.5-km down but covers an area 200-km across. Last edited by neufer on Tue Jul 31, 2018 2:59 pm, edited 1 time in total. Not accurate. Only the northern white rhino is (most likely) extinct. ... The northern white rhinoceros or northern square-lipped rhinoceros (Ceratotherium simum cottoni) is considered Critically Endangered and Possibly Extinct in the Wild. ... the southern white rhinoceros, with an estimated 19,682–21,077 wild-living animals in the year 2015. Yet another Galactic fishing hole. Oh, the wondrous opportunity to fly fishermen .. those who fly in spaceships that is. During which Martian "season" was this photo of the pole taken? Spring, summer, winter, or autumn? The image was made on 17 December 2012. That was about halfway between the southern spring equinox (29 Sep 2012) and the southern summer solstice (23 Feb 2013). If this image were of Earth's southern pole, it would correspond to early November. Late spring or early summer. What are we seeing? 1 m? 1 km? 100 km? <<The south polar permanent cap is much smaller than the one in the north. It is 400 km in diameter, as compared to the 1100 km diameter of the northern cap. Part of the ice cap consists of dry ice, solid carbon dioxide. Each winter the ice cap grows by adding 1.5 to 2 meters of dry ice from precipitation from a polar-hood of clouds. In summer, the dry ice sublimates (goes directly from a solid to a gas) into the atmosphere. During each year on Mars as much as a third of Mars' thin carbon dioxide (CO2) atmosphere "freezes out" during the winter in the northern and southern hemispheres. The south polar cap is higher in altitude and colder than the one in the north. The residual southern ice cap is displaced; that is, it is not centered on the south pole. Studies have shown that the off center cap is caused by much more snow falling on one side than the other. On the western hemisphere side of the south pole a low pressure system forms because the winds are changed by the Hellas Basin. This system produces more snow. On the other side, there is less snow and more frost. Snow tends to reflect more sunlight in the summer, so not much melts or sublimates. Frost, on the other hand has a rougher surface and tends to trap more sunlight, resulting in more sublimation. <<The informal name Sputnik Planum was first announced by the New Horizons team on a press conference on 24 July 2015. A planum is a flat region of higher elevation (a plateau). When topographical data was analyzed in early 2016, it became clear that Sputnik is actually a basin, and the informal name was changed to Sputnik Planitia. Sputnik Planitia is presently close to the anti-Charon point on Pluto, a result that has less than a 5% probability of arising by chance. Sputnik Planitia, the western lobe of the "Heart", is a 1,000 km-wide basin of frozen nitrogen and carbon monoxide ices, divided into polygonal cells, which are interpreted as convection cells that carry floating blocks of water ice crust and sublimation pits towards their margins; there are obvious signs of glacial flows both into and out of the basin. It has no craters that were visible to New Horizons, indicating that its surface is less than 10 million years old.